Twenty surveys were conducted in the northern Gulf of California between 2 and 30 October 2008. We observed 13 groups of vaquitas and several dozen high-quality images were obtained, which are currently being used for conservation and education purposes. We were also able to identify six individuals from natural markings, although two of these may not possess markings suitable for long-term identification. 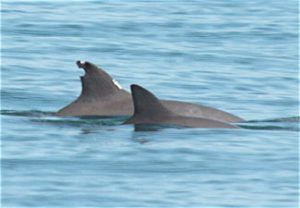 Based on the small sample, an estimated 24-31% of adult vaquitas possess long-term markings. All photographed individuals appeared healthy, with no evidence of malnutrition, and several calves were observed. It will be extremely difficult to ensure the long-term survival of the vaquita as long as we know so little about its ecology. The present project is designed to provide much-needed data on the species that will aid in its future management and conservation. In the long term, we hope to see the vaquita’s recovery and removal from various endangered species lists.